Post subject: Re: Nepomuk in motion! Great video! I love how you manage to persuade him to go over the mountain, and then his energy just gets more and more heightened. Thank you, Sunny! Mucki taught me well how to get him more energetic . He is the best teacher in that regard . this looks like a lot of fun and i really love the micro movements he gives you, how he checks in with you with every step, how he has his own mind but really like to participate in the dialog you 2 have together. i was happy to get a gimps of Anna at the end and at Mucki at his winter paddock (is it?) with friends. Oh I'm happy you liked it, Anat! It was definitely lots of fun . Sometimes I wonder, if I'm directing those games too much, but then again, he tells me quite clearly when he wants to play differently. Like when I asked him to go over the jump, he stood for a while and watched me to see if what I was doing was really fun. And then walked on the tarp again. He just wasn't done with playing with it yet . Well done Volker and zermilike Mucki. Not bad, isnt it? That's 80cm, after all . Anything higher than that, Mucki has to do alone - I'm afraid I've reached my height limit . Your play videos are such an inspiration, Volker! To me your way of playing with Mucki looks very much like that of Nora and Nelly playing with the ponies. 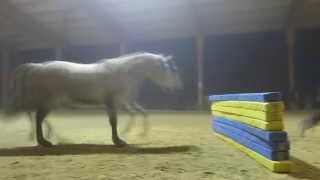 They also just run and jump over the obstacles, and have so much fun that sooner or later the ponies will follow them. Sometimes I wish I was a bit more like that as well and not so controlling (binding the horse to my body language, observing him all the way while approaching the obstacle, stopping if I see that he won't jump... ). So if it was up to me, you could post dozens of these videos, it's good for me to see that again and again and again. Finally I can post a video of our pirouette experiments. It's all rather sketchy right now, but maybe interesting to see the beginnings. I started out by working on travers spirals - decreasing the diameter of the circle more and more. On the video I can see that it's still hard for Mucki to get the outside hindleg under his weight most of the time when he's on a small circle. It may also be due to my body language and position during the exercise. I am still figuring out the right position and walking rhythm in order to help him more than hindering . Anyway, Mucki was in a good mood and started to offer his rearing pirouettes, so we ended up doing that . Did I mention, he looks like Zermi???? Though, he seems to be much calmer. On the video I can see that it's still hard for Mucki to get the outside hindleg under his weight most of the time when he's on a small circle. It may also be due to my body language and position during the exercise. your going so fast, everytime i take a look on this site i see a new film of you with new funny games. love it, both of you are great! Love to see it each time again. Today, I have two videos for you... one of Lily, chasing the tiger to the death . And one of my session with Mucki yesterday. The most important part for me being the (albeit very subtle) signs of piaffe, which was definitely a premiere. And of course, your Mucki stuff is so nice again. Very beautifull Piaffe attempts.